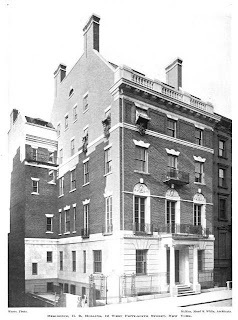 The Harry Bowly Hollins residence designed by Stanford White of McKim, Mead & White c. 1899 at 12 West 56th Street in New York City. Hollins was founder of the stock brokerage firm of H.B. Hollins & Co. and a close associate of J.P. Morgan. Click HERE for the Landmarks Commission's designation report and HERE to see the Hollins residence, which is now the Consulate General of Argentina, on google street view. Photo from Architecture, 1901. Awesome you ever do a post on the Senator William Clark Mansion? Or what about the Duke mansion that sold for $45 million I believe on upper fifth Ave? We can make requests? A post on the incredible Senator William Clark house would be most enjoyable. Zack notes it on his long "things to do" list. Awesome read. I actually bought the "Great Houses of New York " book and two great views and floor plans are there. But I don't care what the critics say the Clark mansion will always be one of the greatest masterpieces in U.S. architectural history. 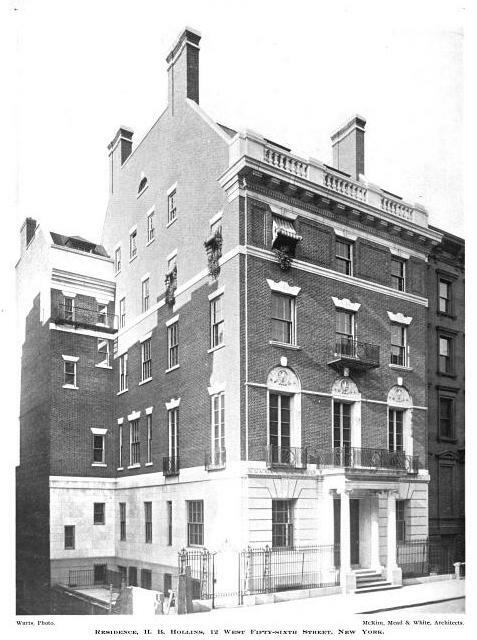 A great deal of criticism directed at the house was due to "societies" distaste for the man himself well known for his gruff and hardnose business dealings, as if anyone living on fifth Avenue was innocent of such behaviour, yet the interiors contained priceless panelling and a serious art collection which could put most of Clark's neighbors mansions to shame. Definitely a memorable house. "as if anyone living on fifth Avenue was innocent of such behaviour"
In fact, nearly everyone living on Fifth Avenue in those days was innocent of such behavior. Carnegie, Jay Gould, Frick, Cornelius Vanderbilt, etc, not hard nosed business men? Anyone who rose from rags to riches and many of them did very quickly during the Gilded Age, trumping their competition, were most definitely tough, determined and hard nosed business men and I think that was actually meant as a compliment. I also would not want to find myself on the wrong side of Alva Vanderbilt, The Mrs Astor, Maime Fish, Caroline Vanderbilt, etc, as the women behind the men were often as shrewd, powerful, strong willed and calculating in their roles as leaders of society. Society has always turned up their noses at new money and anyone coming directly from the mines or mills and within a few short years living in a virtual palace on Fifth Ave was surely seen as unwelcomed. Yet the leaders of society and business had done the very same thing not too many years before, but liked to forget that small coincidence.